To add elegance and beauty to a garden or landscape, include a palm tree in your must-have garden list! Especially recommended if it is a tropical garden setting. Macarthur Palm is one attractive and impressive palm tree you may want to consider. Best to plant it straight into the ground for optimum growth and enjoy its majestic beauty, though it can be container-grown if garden space is unavailable. 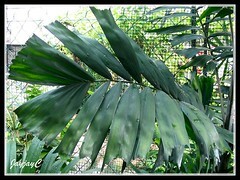 A very hardy, easy to grow palm that practically thrives on neglect in the tropics! Even their seeds self-sow freely in our garden, as if choosing their choice plot. Haha…must have been the birds dropping goodies from the sky, dispersing the palm seeds in their droppings. Every once in a while, some palm seedlings will emerge unexpectedly to delight us! Frankly, our potted Macarthur Palms, 2 plants at the front yard and another at the backyard, have originated from these marvelous surprises! Origin: Northern Queensland in Australia and Papua New Guinea. 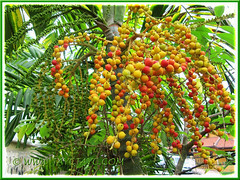 However, it is widely cultivated elsewhere in the tropics where the warm humid weather is most conducive for its growth. 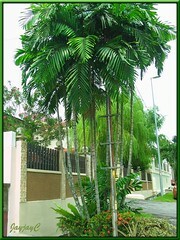 Features: Ptychosperma macarthurii, a species of the genus Ptychosperma, is an evergreen clustering palm of variable height with a slow to moderate growth rate, depending on the growing conditions and environment. It can reach up to 9.1 m (30 ft) tall, but generally grows between 3-6 m in height, with a frond spread between 1.8-3 m. It can be planted singly or in groups. Popularly grown for its ornamental beauty, it is typically multi-trunked, with impressive clumps of upright and slender stems that are grey-coloured and ringed by leaf scars. Extended above is a short light green crown shaft that supports a dense head of pinnate or feather-shaped fronds that are about 1-1.5 m long. Coloured medium to dark green, the pinnae or leaflets are linear-shaped and up to 30 cm long, with jagged tips or seemingly torn ends.Emerging year round at the base of the crown shaft are clusters of branched flowering stalks, 0.6 m long, bearing inconspicuous off-white or whitish-green flowers that eventually develop into green fruits. These fruits will ripen to a brilliant red tone, almost roundish-shaped and about 1.3 cm long. 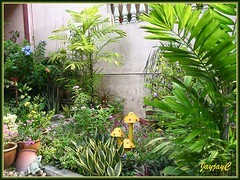 Truly attractive and showy in fabulous contrast with the cool and refreshing-looking green foliage. Culture (Care): Ptychosperma macarthurii is such an easy plant to grow and to care, needing minimal attention. Light: Best with filtered sun or bright light. However, it can grow in various light conditions, from bright light or full sun to full shade, or part sun/part shade. Ground-planted palms in brightly lit sites will be large and vigorous growing, whilst container-grown plants in shade will grow slowly and be smaller and petite, suited for indoors. Moisture: Medium water requirement. Though drought and heat tolerant, it benefits from regular watering, especially during the dry seasons, to enhance the vitality of foliage crown and stems. Soil: Adaptable to any well-drained soil type – clayey, loamy, sandy, slightly alkaline and even acidic soils. Prefers soil that is rich and moist, and enjoys high humidity. Others: Remove unsightly withered leaves, if within reach, to maintain tidiness. Trim off or remove some small basal shoots if there are one too many, especially if container-grown to reduce congestion and improve aeration. You can then use these suckers to propagate as new plants. Monthly feeding with a balanced fertilizer is beneficial. 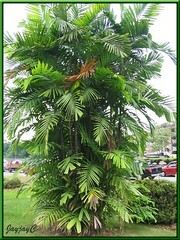 Macarthur Palm is generally free of serious pests or diseases. For subtropical regions: Hardiness: Zones 10B through 11. 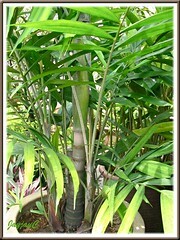 Where not hardy, grow as an indoor palm in containers. Propagation: Easily by seeds. Collect some dried-up seeds, scatter or push them about 1 cm deep into your garden bed or potted soil at a sunny spot. With regular watering, they should germinate within 1-3 months. Germination can be hastened by soaking the seeds for 3 days or by scarifying before planting. It can also be propagated by division of suckers that emerge freely from the parent plant as seen in the right image. Just take a very sharp knife to gently separate the very young and small suckers and grow them as new plants. 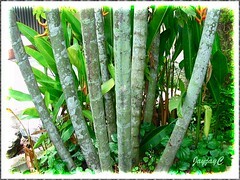 Usage: Looking elegant and stately in its clumping habit, Macarthur Palms will be excellent for landscaping. Suitable in parks and gardens as an ornamental specimen or grown en masse, along sidewalks, road dividers, highways and byways. Great to flank both sides of home entrances or driveways with these majestic-looking palms. Ptychosperma macarthurii is very adaptable to varying light and planting conditions. Thus, it can be grown in containers or above-ground planters to contain palm height and be ideal as indoor plants or to add interest at patios, decks, shopping malls and other public areas. 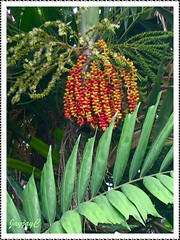 Here’s sharing more pictures of Ptychosperma macarthurii (Cluster Palm, Macarthur Palm), from our garden and elsewhere. Enjoy! 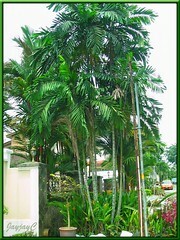 I have seen this palm along the streetsides where it had been using for landscaping. I had able to take the baby shoots that just sprouted from the sides of the trunk. But many times, they don’t seem to be successful after the transfer as they slowly turn brown and dry up. Really not sure what I did wrong. A young shoot must have healthy roots to grow, James. Probably those that you separated didn’t have them and thus weren’t able to survive. My son encountered the same problem with one of the young suckers of Lady Palm that I gave him. To ensure success, try digging a little deeper around the sucker that you want to separate from the parent trunk so that its roots can be shoveled out together. 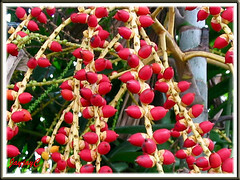 Thank you very much for identifying this palm tree that we often see everywhere. I’m really at a loss as to the names of many palms and trees that line our roads and public areas. This palm looks like it need a lot of space. I have grown 3 pinang merah palms on my small garden plot and now regretted it because it take up a lot of space. The dead leaves are large and not easy to dispose off. I have to cut them up into small pieces before the garbage collecter is willing to collect. You’re most welcome, Autumn Belle! Me too, I can’t remember the botanical names, offhand…the common names are much easier for me. Haha…almost all the plants’ names in this blog are gathered after much googlling and research online, though most are now not registered permanently in my human database!! LOL!! 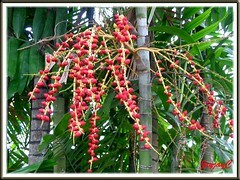 Pinang Merah Palms…is it also known as Lipstick Palm that I just wrote about here: https://www.jaycjayc.com/lipstick-palmtree-crytostachys-renda? If so, I can understand your problems, having experienced them before. Remembered too that we suffered blisters and body-aches when we had to remove them from our garden a decade ago! But it was wonderful having enjoyed them while it lasted. Thanks a lot for visiting and sharing your thoughts…really appreciate! When i was staying for a week vacation in my friend’s house in UKM (University Kebangsaan Malaysia), i was fascinated by the plant in her yard. The flowers are so nice, waxy and the trunks have may thick thorns. They call it 7-needle plant. Do you happen to know it. If you have an email add i will attach it for identification, that is if you dont mind. I hope you know it. Thank you so much. Sorry, Andrea! Basing on your description of the flowers and trunk, I know not of any plant resembling that. The closest is Bougainvillea with thorny stems but flowers are papery, neither waxy nor known as 7-needle. Jacq, is Andrea talking about the Euphorbia milii (Crown-of-thorns or Christ Plant) ? The description looks like it. Andrea – it’s very likely that the plant with waxy flowers and thorny trunk that you’ve described could be Euphorbia milii as suggested by Autumn Belle above. Have a look at some pictures/features of this plant at our article here: https://www.jaycjayc.com/euphorbia-milii-crownofthorns/ for comparison. Hope the ID fits your query. I am very sorry for the 2 of you, Jacq and Autumn Belle, i was absent here for a few days. The plant i am inquiring about is not bougainvillea nor Euphorbia millii. I am also familiar with most plants but this one I just saw for the first time in Malaysia. I will be posting it in my blog (asap) so please help me with its ID. Thank you very much. You two are very diligent in posting, serve as my snack, hehe. Will try to help ID your plant if I can, Andrea! But how…you’ve not disclosed your blog address for access to its pictures? Hi Jacqueline, I have 2 photos of what I believe to be the flower clusters you describe above. Would you accept an email from me, containing those photos for verification? I took them at Akaka Falls, on Hawaii’s Big Island last month. Thanks! Hehe…frankly, I’m no expert on plants/flowers ID, Kathleen! Just a home-gardener who enjoys collecting information online or elsewhere about plants and the like and sharing them here. The best advice I can render is to click on some of our photos above to view them large and make comparisons with your photos from there. Sorry! No problem! I’ve since had the photos ID’d as the MacArthur palm by the folks at the Hawaii Tropical Garden near Hilo, so I was on the right track. If you want to see them for possible addition to your website, I’d be glad to send them your way. Glad to know you’ve had them verified, Kathleen. Thank you so much for your generous offer. As it is, I think the photos here are more than sufficient to illustrate the features of this palm. 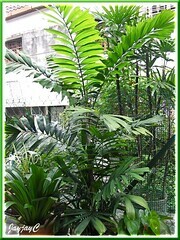 I was wondering if you can share with me the pictures of this palm’s seedlings and saplings? I’m not sure if those I’ve got are in deed that of P. macarthurii. Sorry, Hazel…we don’t have images of its seedlings and saplings. I read with interest your writing. I hope you can help me to understand why my mature MarArthur palm tree ( 8m height ) withered away. Is it because of insufficient watering, disease on the stem or lack of no fertilizer. I intend to buy 3 more MarArthur palm to plant again and do not look forward for them to withered again. So sorry, I’m clueless as to why your mature palm died. 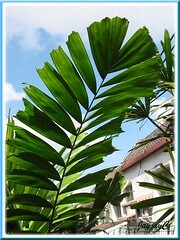 I know that these are very tough and hardy palms that can withstand many hazardous conditions. what is the root system on these palm, part of my drive way is coming up palm has been there for 17 years? Sorry Vinny… we’re clueless about its root system. 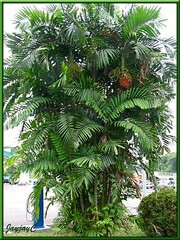 Does anyone have info on a smaller version of the Macarthur Palm (Ptychospermum Macarthurii)? Ticket on plant says it only grows to 2m – 4m (I think that’s 6 to 12 feet). I think if you grow this beauty in a large pot and keep it pot-bound, you can contain its height to below 3 m. If it is planted in the ground, it’ll definitely reach very much higher.